You want your dental professionals to be sincerely interested in you and your long-term dental health. Our clinic staff place great importance on patient education and have made it a key element of this practice for over 20 years. The clinic houses two separate dentists, Dr. Tom Greene and Dr. Sarah Harland, both of them residents of the community who have served patients with diligence for many years. Dr. Harland recently took over the practice of now-retired Dr. Larry Leslie. She is an experienced dentist with more than 18 years of clinical expertise who shares the same patient care philosophy that was established by Dr. Leslie and Dr. Greene. Both Tom and Sarah and their staff ensure that all patients understand the proposed treatment before it begins. They always offer alternatives for any treatment prescribed and take the time to discuss the pros and cons of each alternative with patients. Your dentists and their staff are continually improving and updating their dental education through continued professional development. Patients benefit from improved knowledge. The implementation of new technology and techniques ensures all treatment is up to date and of the highest quality. 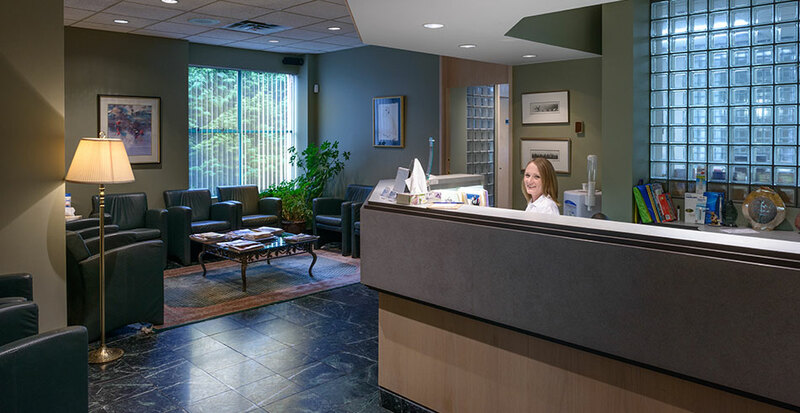 Tsawwassen Place Dental Clinic operates as two distinct dental offices under one roof. All our staff are highly experienced and provide exceptional levels of dental care. Take a moment to get to know the members of our team. With 18 years of clinical experience, Dr. Harland received her Bachelor of Science in Biology from UBC in 1994 and graduated with Honours with a Doctor of Dental Surgery from Case Western Reserve University in 1999. She was immediately accepted in to the Residency program at Vancouver General Hospital and worked alongside experts in dentistry at UBC Dental Clinic & Hospital, BC Children’s Hospital, and The BC Cancer Agency, working alongside top oral surgeons including Dr. William McDonald and Dr. Kenneth Chow. Married and a mother of two girls, she has a keen interest in helping children create a lifestyle of dental care. Dr. Harland participates in continuing education courses to ensure her skills remain current. She’s a health and fitness enthusiast who loves to hike and run, finding the community of Tsawwassen a perfect environment for an active lifestyle. Chantelle is local to Tsawwassen, having been born and raised in South Delta. She has a vast experience in the dental field, and has worked in numerous positions within dentistry including chart audits, study club coordinator, human resources / personnel, accounts receivable, office consulting and implementing various dental systems. Of significance, Chantelle spent a year working in Kenya at a handicap orphanage working as an aid worker. While there, she performed many duties both dental and medical, in support of the handicapped children within the orphanage. Chantelle’s friendly smile, kind demeanour and extensive knowledge will immediately make you feel comfortable and at ease when you arrive at our office. Debbie’s goal is to have patients feel comfortable and at ease in the dental chair while helping patients achieve their oral health goals. A smile goes a long way. Debbie has an interest in fashion and would love to do more traveling with her husband and daughter. Irena has been in the field of dentistry for more than ten years. Prior to graduating from the Dental Hygiene program at Vancouver Community College, Irena practised as a dentist in the Ukraine. She loves to create a warm and welcoming environment for her patients, while helping them to maintain their most healthy and bright smiles! Irena is a member of the British Columbia Dental Hygienist Association (BCDHA), and attends dental conferences and seminars to stay current on dental hygiene related issues. Irena enjoys educating patients and assisting them in improving their oral health. Pavan was born in India and immigrated with her family to Canada in 2003. She graduated from the school of dentistry in India Gujarat, continued her education in Canada and has graduated from both the Registered Hygienist and Certified Dental Assistant programs. Pavan is passionate about delivering excellent oral care to all her clients and takes pride in keeping the highest level of practice standards. She looks forward to helping her patients to achieve and maintain optimum oral health through the best and most current dental practices available within Dentistry. Laura has been a valued team member of Tsawwassen Place Dental Clinic for 19 years. She graduated from the Dental Hygiene program at Vancouver Community College in 1994 and prior to that she was a Certified Dental Assistant. Laura’s professional mission is to stamp out gum disease, one mouth at a time. She lives locally with her husband and daughter, and her family is actively involved with various community sports teams. In her free time, Laura loves to cook gourmet meals for her family, and enjoys showcasing her passion and talent for interior design. Joselyn is originally from El Salvador but has lived with her family in Canada for many years. Both Joselyn and her sister are dental receptionists and love being able to help their patients achieve optimal dental health. Andree has been with Dr. Greene’s practice for 26 years in many locations around Tsawwassen. She enjoys gardening, running and all sorts of physical activities. She also dotes on her animals every chance she gets. Elaine emigrated from Scotland with her husband and two daughters. Her family now includes three grandchildren who keep her entertained. She loves to dabble in acrylic painting and exploring the amazing city of Vancouver.